At E3 one of the games I was aiming to make sure that I got the chance to play was The Division and I know many other people had their eyes on it as well as one of their must play games of E3 this year. I can for one say it definitely didn’t let down but I was however surprised to see a few things, mainly the use of damage numbers how they were used. If anything as we were thrown in the middle of the game at level 12 it was bit confusing on how much damage my weapon was doing comapred to their health and how many shots should kill someone. However that’s it on the downsides, Lets start off with what we played. 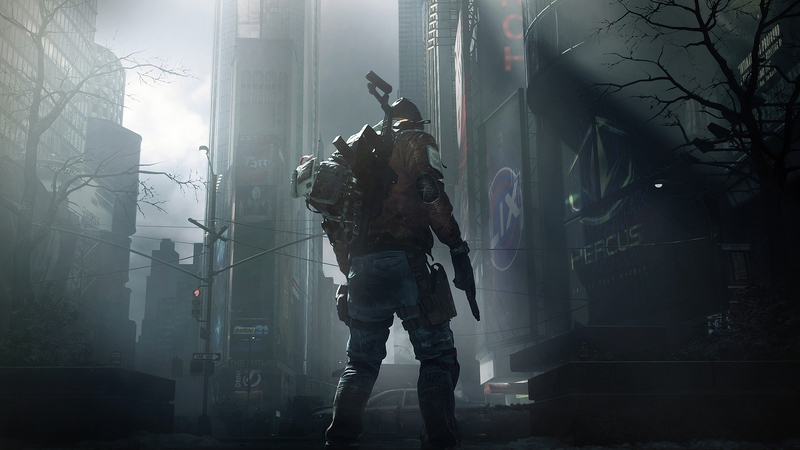 With the Dark Zone, we want to bring together the best elements of multiplayer, cooperative and emergent gameplay to create a truly unique environment that can be entered seamlessly from the main game. 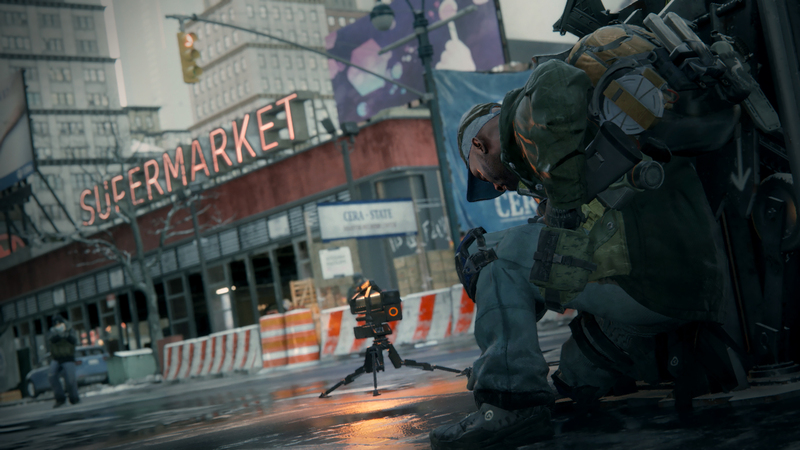 You can play alone or in teams, with and/or against other agents. You will also encounter roaming factions, trying to take control of the area. You can enter this area completely seamlessly, with no loading time, by climbing over the quarantine wall. Once there, you will be able to find legendary loot by completing events and defeating enemies, but be careful to not get it stolen by other players. 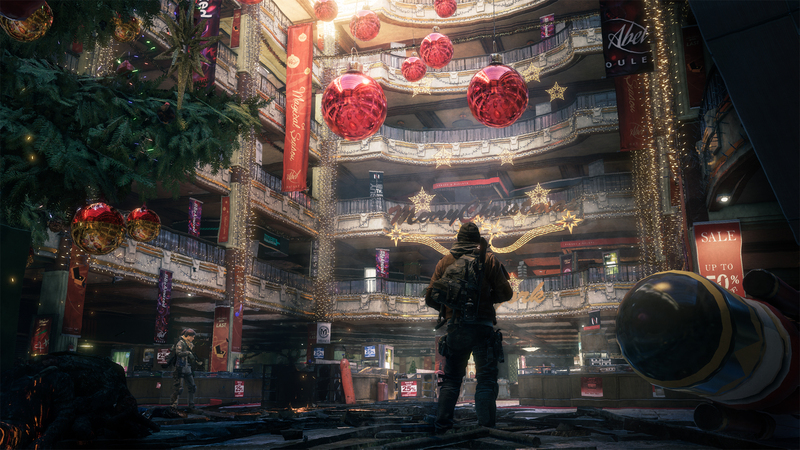 The Dark Zone is all about fear, tension and paranoia. You should trust no one, and as you saw in our gameplay trailer, not even your team mates who might decide to keep the loot for themselves. Once you acquired loot, it needs to be extracted by a helicopter and decontaminated it in order to use it in the rest of the game world. To start the process, you need to go to an extraction zone, shoot a flare in the sky which will signal the helicopter that you want to decontaminate some loot. However, everyone who is around will also see the signal. So during the 90 seconds it will take for the helicopter to arrive, you will need to hold tight and fend off all those who will try to steal this hard earned loot from you. Now that you should have a fair enough idea on what we got to play inside The Division booth First I think we should go into how the game itself feels, and well It actually felt great, all actions were very smooth from taking cover behind objects to aiming. I never felt that I was being held back gameplay wise due to any mechanic one way or another. Since we were thrown into a “match” of The Dark Zone it was a full on 3 v 3 v 3 chaos. You start by coming in from 3 separate lanes into one central plaza (The same you saw from the gameplay trailer.) then you fight to extract your loot. 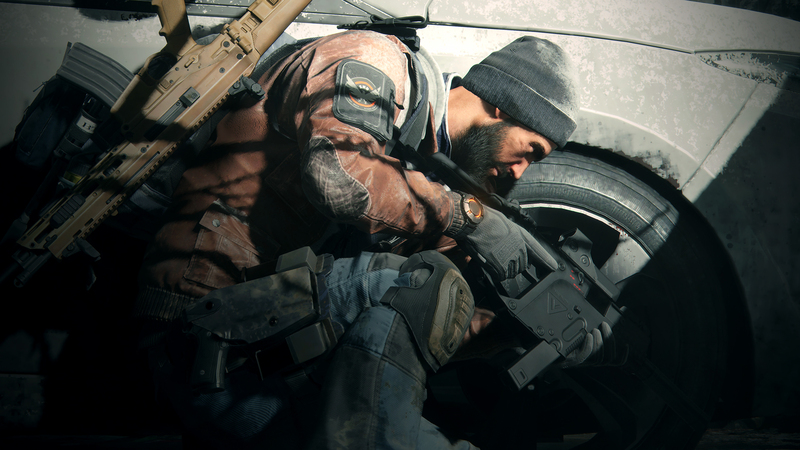 At the beginning you start versus AI opponents part of the Rikers faction stuck in the Dark Zone trying to get their own loot and you end up stealing theirs (or you could die I suppose, though it didn’t seem too possible.) and then head to the center. We were presented with an optional fight it seems like against the Cleaners faction group as well. They had flamethrowers but still were taken down easily enough with concentrated firepower and clever tactics. The real fun and challenge came when we got to the center (First mind you!) and shot up our flare to call in the extraction helicopter to get our loot out of there and in safe hands. However as you would expect there was 2 other teams trying to win this as well. Quickly we saw one group approaching and took positions after using our Pulse ability to locate them through the walls. After that we had a fight with them and took home the victory unfortunately that’s when the other team came at us too. We lost one of us in that next fight, however since the respawn times were rather short (10-20 seconds) We got the full squad back up and in good standing rather quickly and extracted our loot first Then it was time to get good and greedy. We had our loot secured sure… but there was 2 other teams worth of loot. That continued for about 10 minutes of constant fighting around the extract zone and trying to get even more loot out and we got a few more pieces out as well. I believe we might have been the only team in that match to get out any loot at all even. The last stand we had before the game ended around the last extraction of loot was likely the best part, after we all had got more accustomed to the controls more we stood even more of a challenge to the other teams making sure to use our pulses more often, throwing grenades to take out the enemies behind the cover that we saw with pulse and among other abilities to our advantage we managed to keep both teams off of us from what seemed like a constant fight against two different teams flanking us at all times. We all died a few times in the struggle but by the time the helicopter got there we were the only ones left around and alive. Overall, I had a BLAST playing The Division at E3, It played great and I can see it becoming a hit game when it releases and I hope many of you will agree with me as I already want to see this game have longevity and be playing it for years to come. 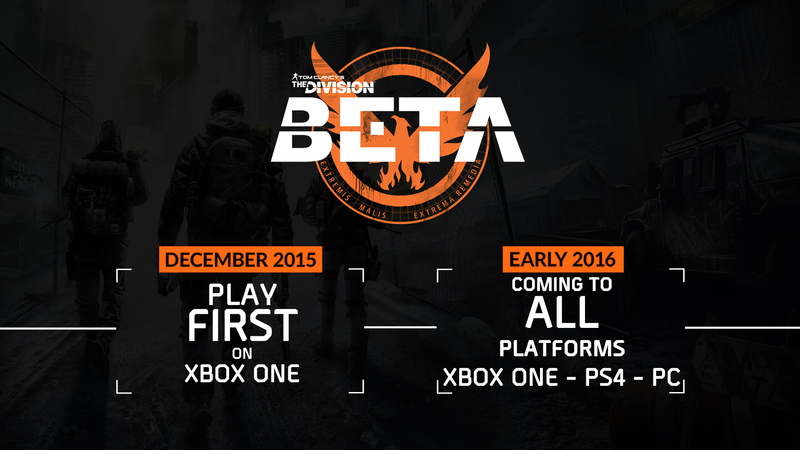 Now also don’t forget, Ubisoft announced The Division Beta as well that you can Sigh up HERE or pre-order for guaranteed access. If betas aren’t your thing and want to just wait until it releases it will be available on March 8th, 2016. Still a bit of a wait but from what I’ve played it’s worth it. Just if you somehow have missed The Dark Zone Multiplayer Reveal Gameplay, I’ve included it below as well. It might also help explain what I’ve included in this impressions in terms of the AI we fought and zone we were fighting in against the players. If you have any questions about The Divsion and how it played in the bit of Multiplayer we got to play make sure to ask in the comments here… and yes, I was worried the whole time my team was gonna shoot me in the back.